This coming Thursday is the Feast Day of the Visitation of the Blessed Virgin Mary and also happens to be my Mom’s birthday. What a great day to be born! With all the great Marian Solemnities that are celebrated in the Church’s liturgical calendar, this is one day that I think get’s overlooked. This Thursday night, the Institute of Catholic Culture will be hosting a study night on the Visitation. If you are in the Alexandria, Virginia area, I would recommend checking out it. As many people know, the Visitation, the second mystery of the Joyful Mysteries, is when Mary goes up to visit her kinswoman Elizabeth after the Angel Gabriel announces to Mary (The Annunciation) that she has found favor with God and will conceive and bear the Son of God. “The Holy Spirit will come upon you, and the power of the Most High will overshadow you; therefore the child to be born will be called holy, the Son of God” (Luke 1:35). What many people don’t realize is that Mary’s going up to the hill country, to a city of Judah, is the same language of 2 Samuel 6 when David brings the Ark of the Covenant up to the hill country of Jerusalem and he leaps for joy as the child (St. John the Baptist) in Elizabeth’s womb leapt for joy on hearing the voice of Mary’s greeting. St. Luke in his Gospel account is making a connection to 2 Samuel 6. It’s an important note of fact that St. Luke more than likely received most of his information for his Infancy Narratives (Luke 1-2) from the Blessed Mother herself. So why is all of this important? First, there is the importance of The Ark of the Covenant. 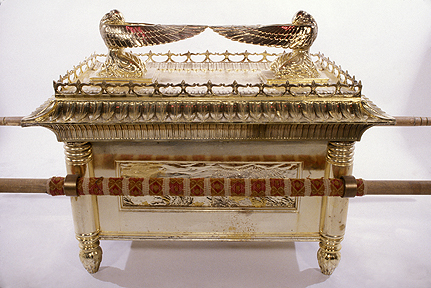 The Ark of the Covenant was the container made from acacia wood and then overlaid with gold within and without (Read Gen 37). The Ark would hold the tablets of the Ten Commandments (the ones Moses made; first ones were destroyed by Moses at the foot of the mountain [Ex. 32:19]), the manna from heaven; and the staff of Aaron (High Priest – Ex. 32:28; Lev 8-9) that budded. The staff was what the high priest carried. The Ark of the Covenant is the artifact that Indiana Jones competes for possession against the Nazi’s in the film, Indiana Jones and Raiders of the Lost Ark – a great film! In the New Testament, we see that Mary is the fulfillment of the Ark of the Covenant. Mary, in her womb, carries the word of God (Word Made Flesh), the bread of heaven (Jesus is the New Bread from heaven – see John 6: 41-51) and the Royal High Priest (Jesus is the New King and High Priest). Mary is now the NEW Ark of the Covenant. The second point of importance is the Greeting of Elizabeth. Elizabeth says, “Why is this granted to me, that the mother of my Lord should come to me?” (Lk 1:43). Essentially, Elizabeth is saying, why do I have this great privilege? In the Hebrew culture, younger to older is often way the way of respect. However, we are not seeing that in this case. Elizabeth is falling all over her 15-year old pregnant niece [Dr. John Bergsma – niece; Dr. Mark Miravalle – cousin; Scripture – relationship is not specified]. She is showing Mary great respect for she knows that Mary is the mother of her Lord (adonai). 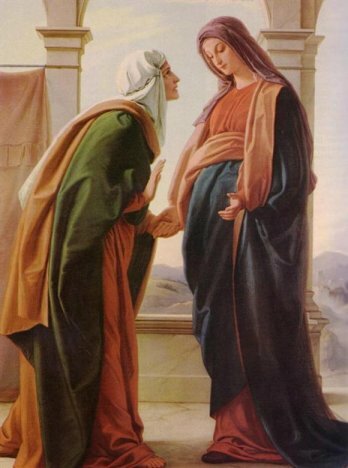 Mark Miravalle says in Introduction to Mary, “In bringing the unborn Jesus into the presence of Elizabeth, two events of grace take place: Elizabeth prophesies by the Holy Spirit and the unborn John is sanctified in Elizabeth’s womb: “When Elizabeth heard the greeting of Mary, the babe in her womb leapt, and she was filled with the Holy Spirit” (Lk 1:41) [pg. 32]. Next time you pray the second mystery of the Joyful Mysteries, I pray that you will reflect and meditate on how important the Visitation of the Blessed Virgin Mary is in the Infancy Narratives and how important this event is in our own journey of faith with Christ. Mary is the fundamental piece in brining all of us closer to Jesus Christ just as she did for Elizabeth and the future St. John the Baptist who in turn who point out Jesus at the Jordan River. For next week’s “Mondays with Mary” I will explain Mary’s Magnificat. 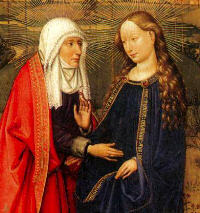 The Magnificat of Mary is an essential element of the Visitation of the Blessed Virgin Mary. Sorry for the delay on this, but it’s Final Exams week and I am grading. I would rather be writing for this blog if you really must know, but grading pays the bills. Catholic Humor with a Little Help from Bill and Ted…Excellent!